A method to selectively enhance or inhibit optical nonlinearities in a chip-scale device has been developed by scientists, led by the University of Sydney. The researchers from the Centre for Ultrahigh bandwidth Devices for Optical Systems, (CUDOS) based at the University of Sydney published their results in Nature Communications today. 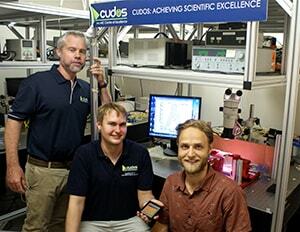 Professor Benjamin Eggleton, Thomas Büttner and Moritz Merklein, researchers from CUDOS at the University of Sydney with the chalcogenide photonic chip. "This breakthrough is a fundamental advance for research in photonic chips and optical communications," said Moritz Merklein, lead author from the University's School of Physics. "In optical communications systems optical nonlinearities are often regarded as a nuisance, which corrupts the flow of information. But at the same time there are many useful applications that harness these nonlinear effects. We showed that we can dramatically enhance the optical nonlinearity so that it can be made even more useful. On the other hand we showed that we can completely suppress the same nonlinear optical effects using the same principle. Importantly our experiments were performed in a photonic chip." To achieve their result the scientists investigated a specific optical nonlinearity that deals with the interaction between light and sound on chip scale devices. "The effect we looked at (known as stimulated Brillouin scattering) occurs when two optical waves and an acoustic wave interact. If the optical wave travelling along a fibre is disrupted - scattered - by the acoustic wave, it produces a backward traveling wave, called the Stokes wave. This nonlinear scattering process can cause signal distortions in fibre communications and signal processing applications and is well known to limit the capacity of optical fiber communications networks." "While we want to avoid this disruption this effect has also some unique properties which can be harnessed for important applications in manipulating microwave signals and developing certain types of lasers. So we have shown that we can selectively enhance or inhibit this interaction, depending on the context or application. We think this approach can be generalized to many other optical nonlinearities." To address this, the researchers introduced a grating structure on to the chip. The grating, which comprises a small modulation in the optical material properties, forms a bandgap for light, which strongly effects the propagation of light, in the same way that semiconductors control the flow of electrons. When the laser wavelength is tuned close to the edge of the bandgap, the speed of light is reduced. This will greatly enhance the optical nonlinearity. At a slightly different frequency, the bandgap will completely inhibit (or suppress) the optical nonlinearity. The grating can be tuned so that the optical nonlinearity can be turned on and off on-demand. "On-chip optical research is a thriving and competitive area because of its importance to manipulating classical or quantum signals in small devices, essential for future communications, computing and information processing applications," said CUDOS director and co-author Ben Eggleton. CUDOS is an Australian Research Council Centre of Excellence and a gold sponsor of this year's International Year of Light and Light based Technologies.